BMC: Alessandro Ballan, Mauro Santambrogio. Footon-Servetto-Fuji: Fabio Felline, Eros Capecchi. Lampre-Farnese Vini: Damiano Cunego, Mauro Da Dalto, Francesco Gavazzi, Mirco Lorenzetto, Adriano Malori, Alessandro Petacchi. Liquigas-Doimo: Ivan Basso, Francesco Bellotti, Daniel Oss, Manuel Quinziato. Stories for the Italian Cycling Journal about rides, granfondos, having a good time cycling in Italy, Italian cycling history, etc. are very welcome. Contact me at veronaman@gmail.com. There are more than 1,400 stories in this blog. The search feature to the right works best for finding subjects in the blog and there is also a translate button at the bottom so you can translate each page. 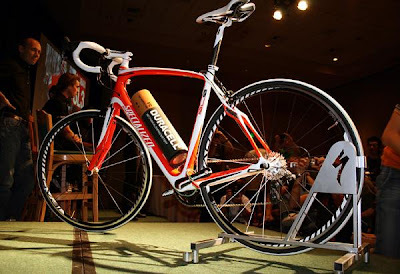 Specialized, the bike manufacturer, showed a sense of humor during their unveiling of the 2011 Roubaix SL3. This is the same frame that was used by Cancellara at Paris-Roubaix during the Spring, and which has the object of speculation regarding if it was motorized. Specialized displayed the new SL3 with a large Duracell battery mounted on the downtube. "Ivan Basso and Roman Kreuziger are the hopes for a good placement in final classification: the Italian returns to France with high moral after the victory in Giro d’Italia while the Czech wants to search for a new quality leap after the great performances of 2008 and 2009. Together with them Liquigas-Doimo will be present with two climbers, Sylwester Szmyd and Francesco Bellotti, and five long distance riders: Kristjan Koren, Aliaksandr Kuchynski, Daniel Oss, Manuel Quinziato and Brian Bach Vandborg. "We can play our chances for a good results in this Tour de France – affirms DS Zanatta -. Basso and Kreuziger allow us to aim high in general classification, thanks also to the reliability showed by their teammates. Koren and Oss, two young riders at their first experience in a long stages race, will have the opportunity to confirm the potential showed during the first part of the season". For Ivan Basso the return in France will be first of all, "a great emotion. I’ll be at the departure with a very good condition, knowing the difficulties of the Tour but sure to be competitive. During these weeks I worked to maintain the resistance and to refine the legs. I face this new challenge with a strong wish to fight till Paris: I don’t preclude any results, the road will return the verdict". "I’m ready in physique and quiet in mind – adds Kreuziger – because I prepared for this event without problems. This Tour is harder than 2008 and 2009: the Alps will be the first step to understand the chances of pretenders, while on Pyrenees the classification will be decided. I’ll exploit this last week to refine the legs to be at the top for Rotterdam prologue: I feel myself stronger in respect to other years and together with Ivan can give hard time to everyone". Sabrina Bianchi, RAAMs First Female Italian Solo Finisher! Sabrina Bianchi has become the first female Italian solo rider to finish the the Race Across Amercia (RAAM). Bianchi completed the 3005.10 mile race from Oceanside, California to Annapolis, Maryland in average speed in 12 days, 16 hours, 51 minutes; average speed 9.86 mph. General Manager Saronni and his technical straff have selected the roster of the team that will take part in the Tour de France from July 3 to 25: Grega Bole, Damiano Cunego, Mauro Da Dalto, Francesco Gavazzi, Danilo Hondo, Mirco Lorenzetto, Adriano Malori, Alessandro Petacchi and Simon Spilak. Lampre-Farnese will be directed by Maurizio Piovani and Valerio Tebaldi, supported by mechanics Biron, Bortoluzzo and Pengo, by masseurs Borgognoni, Capelli, Chiesa, Della Torre and Inselvini, by driver Bozzolo, by doctors Beltemacchi and Guardascione and by press officers Andrea Appiani and Carlo Saronni. About the riders: there will be six Italian, two Slovenian, and one German cyclists. The average age will be 28 years (Malori is the the youngest, 22 years old, and Petacchi the oldest, 36 years). The average height will is 178 cm (Hondo, 186 cm, the tallest, Cunego, 169 cm, the shortest), while the average weight is be 69 kg (Cunego the lightest, 59 kg, Hondo the heaviest, 75 kg). Five riders will be in their first Tour de France: Malori, Bole, Da Dalto, Gavazzi and Lorenzetto. The only one that has already won in Tour de France is Petacchi, winner of 4 stages in the Grande Boucle in 2003. 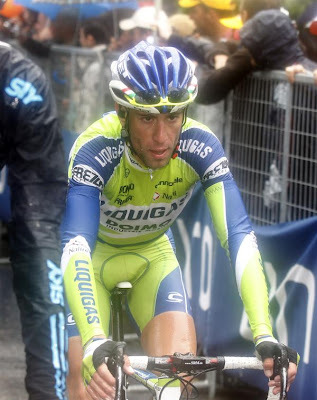 The only other Italian squad int his year's Tour de France is Liquigas - Doimo. For the second year in a row Monia Baccaille has won the women's elite race in the Italian national championships. Giovanni Visconti also took his second Italian road tricolor jersey in the men's race, three years after taking his first in 2007. Visconti (ISD Neri Giambenini) won going away after 259.6 km ahead of Ivan Santaromita (Liquigas-Doimo) and Alessandro Ballan (BMC Racing Team); he had enough time to celebrate before the finish line by grabbing an Italian flag from a spectator. The introduction to this event here. Even the rain stopped to allow the event to take place, Sunday, June 20, over the white roads of Fermo (Marche). Cyclists departed from Montottone escorted by motorcycles and cars, among them the legendary 600 "multipla", the flagship of the good old days. 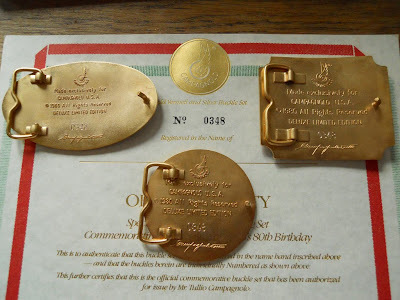 There were many prizes for the riders for the best interpretation of cycling history. The first prize went to Giorgio Minora of Milan who rode a 1938 Legnano, the same model with which Gino Bartali triumphed in his first Tour de France; Minora also wore a tricolor jersey of Alfredo Binda from 1929. 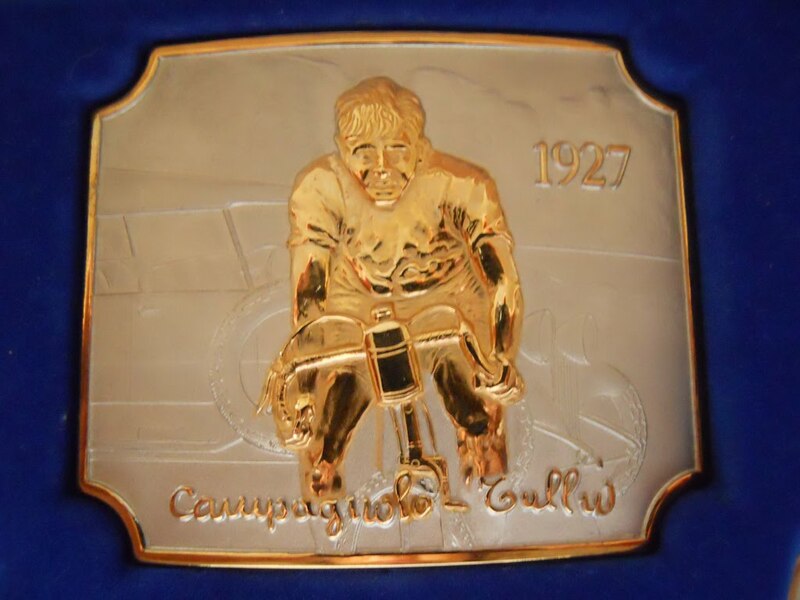 In second place, equal on points, was the former 1950s professional Angiolino Piscaglia riding his Ganna and wearing a Ghigi jersey. Amerigo Severini, many times Italiana cyclocross champion, rode his faithful Bianchi and one of his knit tricolor jerseys to a prize as well. There was an extraordinary lunch for participants featuring local specialties such as Vincigrassi prepared in the traditional way as it had been by the peasants. The inaugural event was very successful and also had the merit of bringing the phenomenon of vintage cycling to central/southern Italy. "No need to cross the Atlantic for an Old World cycling experience - come to Virginia's scenic Alleghany Highlands region for the innaugural Alleghany Gran Fondo. Easily accessible from Interstate 64, and four hours' drive from both Washington, DC and Charlotte, the Alleghany Highlands' majestic peaks and picturesque valleys might be mistaken for a region of France or Germany. With electronic chip timing, a King of the Mountains competition, and an Italian-inspired post-ride feast, all the elements of the classic European Gran Fondo will be here stateside and served up with southern hospitality. No Michelin guide required! Former pro cyclist and brain injury survivor Saul Raisin headlines the participants set to ride the inaugural Alleghany Gran Fondo cycling event in Virginia's Alleghany Highlands region. The event will take place on Saturday, July 10, and features three route options: a Piccolo Fondo of 35 mi., a Medio Fondo of 62 mi., and a full Gran Fondo of 88 mi. All three routes feature challenging courses, fully-stocked rest stops, neutral mechanical support and a post-ride party. Gran Fondos, literally "big endurance" in Italian, are a growing trend in U.S. cycling. These competitive rides - often compared to marathons for cyclists - offer a place on the start line for everyone from professional cyclists to ambitious weekend warriors. The goal of all the participants is the same - to meet the challenge of a difficult route and fully embrace and celebrate the sport of cycling by doing so. "We're excited by the beautiful and exciting routes on hand for the first annual Alleghany Gran Fondo," says Matthew Butterman, Event Director. 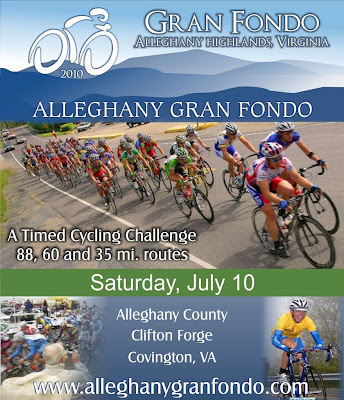 "From the steep climb of Pitzer's Ridge that all three routes will encounter, to the challenge of Warm Springs Mountain and its sections of 17 percent grade, to the rolling roads of the Jackson River valley and the picturesque Humpback covered bridge on the home stretch, the Alleghany Gran Fondo provides a challenge and delight for the cycling enthusiast." By hosting the inaugural Alleghany Gran Fondo, Virginia's Alleghany Highlands region continues its history as a venue for international-level cycling events like the Tour DuPont and Tour of Virginia, and reaffirms its status as a premier destination for outdoor sports lovers. "The friendly people, supportive communities and civic-minded sponsors of our event like Mead-Westvaco and Ntelos have all come together to make this great event a reality. Our collective goal is to make the Alleghany Gran Fondo and the visit to our beautiful region a highlight of the season for cyclists and their families from all over the Mid-Altantic and Southeast," says Teresa Hammond of the Alleghany Highlands Chamber of Commerce. Reflecting the enthusiasm of the event's venue hosts is former pro cyclist Saul Raisin,who will be appearing at the Alleghany Gran Fondo to speak to local youth, ride and raise awareness for the mission of his eponymous foundation. Just five years ago, the cyclist from Dalton GA who was once touted as "the next Lance Armstrong" was lying in a coma, nearly dead from a brain injury sustained in a crash during the closing kilometers of a French race. Now fully recovered, Raisin rides and speaks to give hope and inspiration to others. "I'm really excited to put my name and foundation's mission behind the Alleghany Gran Fondo," he says. "Events like this bring cyclists of all levels together, and its a model for the Raisin Hope Foundation, which unites people from all walks of life, with the common goal of providing hope and support for the victims of brain and spinal cord injuries and their families." Registration for the event remains open through July 9., and AGF commemorative Jerseys are for sale at the Registration page, courtesy of clothing sponsor Capo. 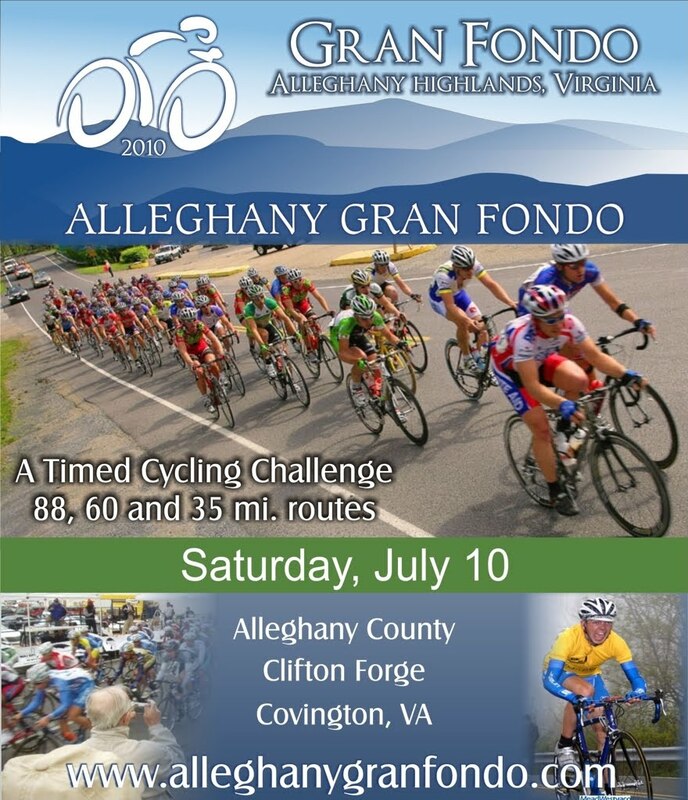 Online registration and full information is available at the event website, www.alleghanygranfondo.com." For a full 2010 calendar of announced gran fondo events in North America go here. The re-finished 500 meter track in Mori (Trento) has been completed and the first competition was held yesterday. 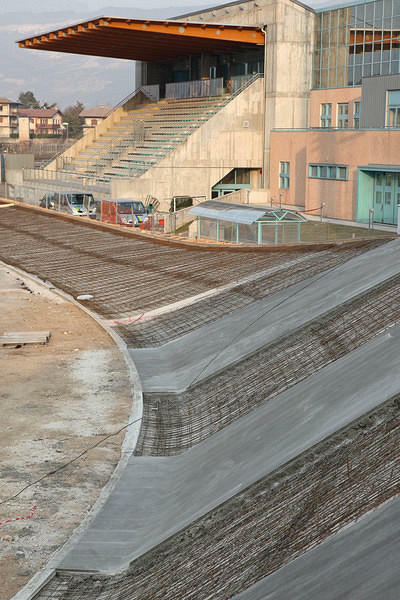 The Mori track will host the "Mori 2010 - campionati italiani di ciclismo su pista" from 22 to 28 August. Davide Cassani is the well known cycling commentator for Italian broadcaster RAI. In 1982 he made his professional debut with Termolan-Galli. In 1986 he moved to Carrera, where he supported figures such as Claudio Chiappucci, Roberto Visentini and Stephen Roche; Cassani later raced for Gewiss-Bianchi, Ariostea, GB-MG and Saeco. He retired in 1996. He is a winner of two Giro d'Italia stages. In 2007, during coverage of the Tour de France when Michael Rasmussen was on his way to winning the yellow jersey, Cassani made a passing remark that he had seen Rasmussen training in the Dolomites. This began the eventual controversy that resulted in the expulsion of Rasmussen from the Rabobank team and the Tour de France on the basis that Rasmussen had previously claimed he had been in Mexico at the time Cassani had seen him. 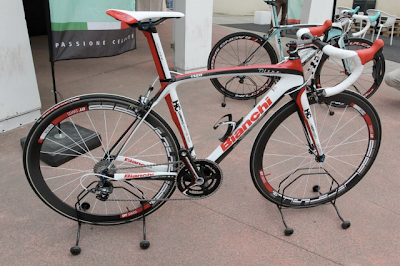 During this year's Giro d'Italia, Cassani reported on RAI about a "doped bicycle", a bike with a hidden motor. At first there was disbelief. Subsequently the UCI decided to investigate the matter further. Yesterday, journalist Michael Bufalino was heard by the Turin police in the investigation opened by the Turin prosecutor Raffaele Guariniello into sporting fraud by the use motorized bikes among professional cyclists. Bufalino is the author of a Youtube video that focuses on Fabian Cancellara victories in this year's Spring Classics of Flanders and Paris-Roubaix. Here is the Cassani report as it appeared on RAI. The important points he makes are: a) the bike has existed since 2004, b) the bike has been used in professional races, c) that he could win a stage in the Giro d'Italia at the age of 50 years old using this bike, d) the entire mechanism is invisible; it is activated by a button on the shift lever. Here is the video (with English subtitles)that was created by journalist Michael Bufalino. “Team Saxo Bank rejects all insinuations and accusations that have been made in the media regarding Fabian Cancellara's alleged use of an electric motor in his bike. Team Saxo Bank is strongly opposed to any form of cheating and there is absolutely no truth to this story. There was not and never has been a motor in any Team Saxo Bank rider's bike,” the statement reads. Passo dello Stelvio: one of "The Magnificent Seven"
"European cycling magazines love to take polls about the best mountain pass in all of Europe. The north side of the Stelvio Pass, or Stilfserjoch, is almost always at the top of the list. The 48 numbered switchbacks (there used to be 50 until some car drivers knocked over the bottom two signs) climbing steeply for over 6000 feet are the hallmark of this Italian gem. This pass is also very popular with cars and motorcyclists, so much so that on weekends, the constant whine of motorbikes can be an unpleasant distraction. It is best to plan your ascent on a weekday, or, better yet, on Stelvio Day-usually the last Saturday in August, when the pass is closed to everyone but cyclists. Starting in Prad on the north side, the first six miles to Trafoi are a good warm-up for the unrelenting slopes ahead. It is eight and a hlaf miles to the summit from here, but the 8.5-percent average grade makes this a very tough grind. 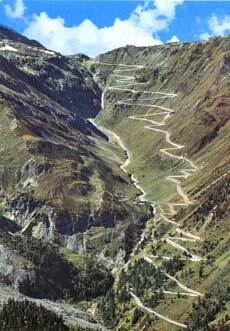 The Stelvio marked the Italian-Austrian border during the Great War, and there were some epic battles. Don't miss the World War I museum on top of the Banco Populare di Sondrio building, which also includes some historic photographs depicting the construction of the road. While not considered as classic as the the north side, the south side of the Passo Stelvio is a 5000-foot climb from Bormio. There are several, narrow, unlit tunnels where lights are recommended. Also, be careful of oncoming cars, as two-way traffic isn't possible in several of the galleries. The Stelvio ranks third behind the Col de la Bonnette and Col de l'Iseran as one of the highest continuously paved passes. At over 9000 feet, be prepared for severe weather at any time of the year." Hildenbrand's article goes on to discuss his other six favorite climbs: Mont Ventoux (France), Sierra Nevada (Spain), Roque de los Muchachos (Canary Islands, Spain), Splugen Pass (Switzerland), and Grossglockner (Austria). 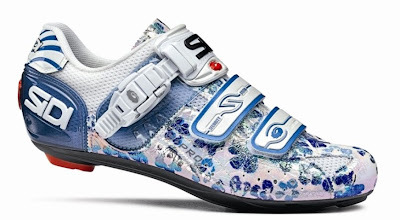 SIDI describes it's new Genius 5 Pro Woman cycling shoe as "beautiful, designed for women who refuse to sacrifice elegance and a touch of femininity while riding." Very stylish, even more so in person. Paolo Bettini has been selected as the new C.T. 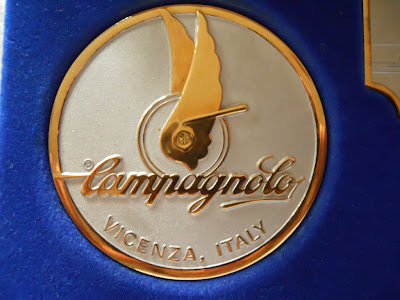 (Commissario Tecnico dei Professionisti) for the Italian national squad. 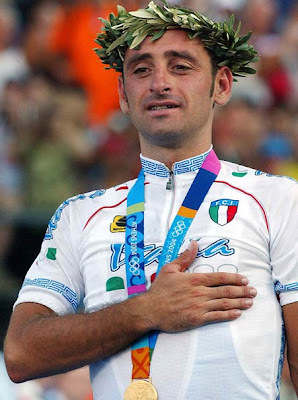 Bettini is a two time World Champion in road racing and winner of the gold medal in the Olympic Games in Athens, Greece. He also won the Italian national championship two times. His installment will take place on June 23rd in Rome. Bettini replaces his friend Franco Ballerini who was killed in a rally car accident in February of this year. "Gran Fondo New York brings Italian cycling culture to the world’s greatest city. The inaugural Gran Fondo New York is set to take place on May 8, 2011. The 105-mile professionally managed event will feature the excitement of starting in New York City, a timed climb to the top of Bear Mountain, beautiful scenery, charming towns and the camaraderie of group cycling. Gran Fondo is a popular cycling event stemming from Italy. With a peloton of 500 to 10,000 participants, a Gran Fondo covers at least 100 miles and goes over challenging terrain. In France and the UK such events are known as cyclosportives. The Gran Fondo New York course will take the 6,000 cyclists from New York City to New Jersey across the iconic George Washington Bridge with stunning views of Manhattan. Riders will follow the Hudson River upstream on Route 9W and nearby rural roads and after 50 miles, arrive at Harriman State Park. There, the five-mile climb up to the top of Bear Mountain will be chip-timed. Riders can measure themselves against New York's finest cyclists, teammates and friends. After descending, the course will wind its way back to the city. Along the way, cyclists will enjoy well-stocked rest stops with New York-style bagels, pretzels and doughnuts, energy gels, water, soda and electrolyte drinks. Throughout the day, medical and mechanical support will circle the course for anyone in need of assistance. The undulating terrain of the course will challenge participants’ strength and stamina. The event is a great opportunity for competitive as well as recreational cyclists, with each participant choosing their own speed at which to complete the event. While the climb to Bear Mountain is the featured timed section, there are other challenging climbs en route that will also be timed. After the race, prizes will be awarded across age groups, teams and Lui+Lei (him&her) categories. Among the meal options will be New York-style pizza and hot dogs, pasta and cake. Throughout the awards ceremony, raffle prizes will be distributed. Included in the entry fee will also be a professionally designed cycling jersey and various gifts from the sponsors of the event. 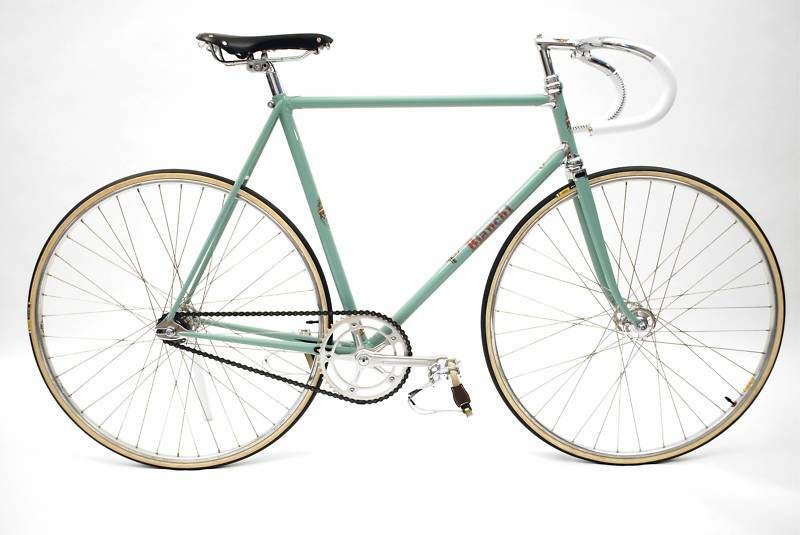 “Our goal is to bring quintessential Italian cycling culture to the world's greatest city. The combination of 'Italianita' and NYC will make Gran Fondo New York an event not to be missed," says Lidia Rekas the event’s organizer. Mark your calendars, registration opens on August 1, 2010." "The new 10-speed project, the result of our experience working with professional cyclists, features the same high quality and technical features as our top-of-the-line 11-speed groupsets. The new 10-speed groupsets have been completely redesigned to improve performance, weight, reliability, and cost. Shifting precision and speed have benefited from our experience in developing the 11-speed project. The introduction of the new Power Shift System™ enables the Ergopower™ shifters to seamlessly control the front and rear derailleurs. Thanks to the new optimised design of the teeth and the internal machining of the sprockets, shifting with Veloce is just as fluid as its 11-speed ''big brothers''. The new 10-speed groupsets introduce one enormous innovation: the brand new Power Torque System™ (see below for more details, after the groupset descriptions). The Campy Tech Lab™ engineers have devised a new bottom bracket. It is more economical, easier to install and service, while offering top level performance features comparable to those guaranteed by the Ultra Torque™ system. All this, at a lower cost. The result of this hard work is incredible: the new 10-speed groupsets are more ''aggressive'' thanks to the reduced weight and price compared to the previous models, along with improved performance. The new Ergopower™ controls with ''classic'' Campagnolo® two-lever system and the new Power Shift System™ for controlling the drivetrain, along with the new crankset with Power Torque System™ bottom bracket and rear derailleur of 11s derivation, all make the Centaur™ 2011 the perfect choice for those who want the top-of-the-line 10-speed. The ergonomic design of the Campagnolo® Ergopower™ controls also used for our 11s groupsets provides the most correct and secure support for the hands in all driving positions. Comfort, one of the most important parameters for your long bike rides, will always be ensured by the Campagnolo® Vari-Cushion™ system. The Centaur™ Ergopower™ controls feature the Power Shift System™ mechanism, which makes it possible to move the chain by three sprockets in downshifting and one in upshifting. Two lever versions are available: in black aluminium or in carbon fibre with core in light alloy. Completely new and redesigned by the Campy Tech Lab™ engineers according to a precise objective: to create a crankset that is easy to maintain, lightweight, and that retains the same U and Q factors of its ''big brother'' Ultra-Torque™. But that wasn't enough. Our engineers wanted to do more; i.e. to drastically improve shifting performance. In order to achieve this demanding objective, the gears of the Centaur™ crankset have been completely redesigned. The eight sectors dedicated to the upward movement of the chain, the two for the downward movement, and the new MPS Micro Precision Shifting™ machining of the teeth make it possible to shift rapidly and without any hesitation. The ultra-high quality bearings, positioned in the most extreme points of the central axle, guarantee the maximum smoothness and perfect efficiency of the pedalling over time. The new Power Torque System™ used for the Centaur™ crankset is the ideal solution for the Campagnolo® 10s drivetrains, with high rigidity of the cranks and chainrings along with an extremely limited weight, to achieve the most efficient power transmission. The Centaur™ rear derailleur has been completely revolutionised compared to its predecessor. Absolute precision and reactivity are guaranteed by the new outer plate made of aluminium as per the 11s design. The design of the upper and lower bodies has been optimised to achieve the maximum rigidity and at the same time to reduce the weight. The cage, too, thanks to the new geometry, is more rigid and lighter, and the silicone rollers reduce vibration and improve the silence of the drivetrain. Compact or traditional crankset? The Centaur™ front derailleur can handle both solutions with no indecision. The M-Brace™ design of the front derailleur body and the inner arm in Z-Shape™ configuration ensure an unprecedented rigidity that translates into excellent shifting precision and speed. Quiet on the set! Roll'em! The Centaur™ chain is incredibly quiet thanks to the Teflon wax treatment and the link-pin coupling geometry that reduces friction to the minimum, prolonging the life of the chain and ensuring less dispersion of the power transmitted. 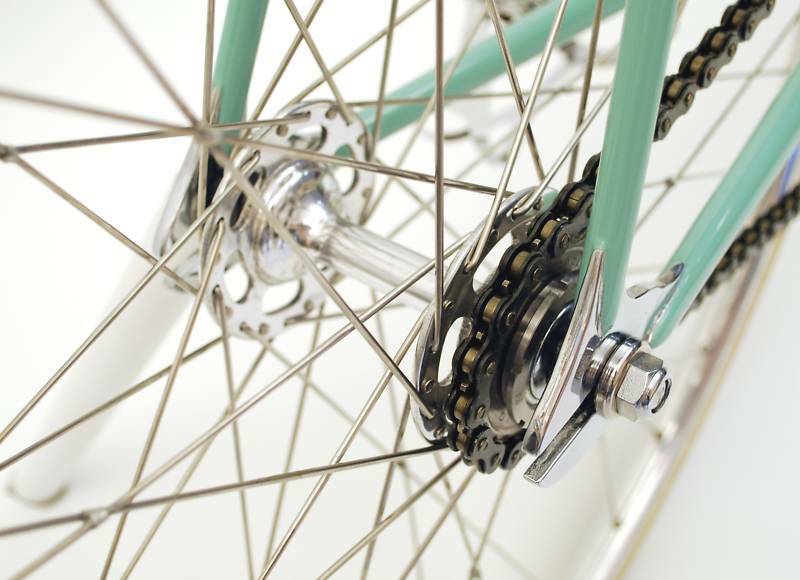 The precise sizing of links, rollers and pins reduces the interference with chainrings and sprockets adjacent to the ones in motion. The profile of the teeth, completely redesigned in line with the Ultra-Drive™ project, makes it possible to achieve the maximum response speed at the moment of shifting. The synchronisation obtained by establishing a specific position of the teeth between sprocket and sprocket makes the passage from one sprocket to the next very fluid and fast. And in order not to lose rigidity, the last two are fitted on an aluminium frame. Have no fear of going too fast: safe stopping is assured by the new Centaur™ brakes with forged arms and characterised by the new black anodising. In order to achieve even greater efficiency, the brakes are equipped with the possibility of orbital brake-pad adjustment, which up till now was a feature of only the high end of the range. The braking torque is optimal even with new pads. The weight is 315 grams. The Veloce™ components are top-of-the-range and offer technical solutions analogous to the Centaur™, but with a choice of materials and machining that make them even more aggressive in terms of price/quality ratio. The components of the Veloce™ 2011 groupset are proposed in two versions, black or silver: the choice is yours. Ergonomic, like the top level 11-speed models: the Veloce™ Ergopower™ controls have the same forms, security, and comfort. The brake lever is in aluminium, while the shifters are made of composite material to reduce weight to the minimum. Like the Centaur™ groupset, thanks to the Power Shift System™ mechanism, it is possible to move the chain by three chainrings in downshifting and one in upshifting. The Veloce™ crankset adopts the brand new Power Torque System™ also used for its ''big brother'' Centaur™. The Power Torque System™ represents the ideal solution for the new Campagnolo® 10s drivetrains: high rigidity of cranks and chainrings along with extremely limited weight, efficient power transmission thanks to optimised Q and U factors, new chainrings with MPS Micro Precision Shifting™ machining of the teeth and new machining on the upward zone of the chain. All this makes the Veloce™ crankset one of the most highly evolved technological solutions, but also one of the most economical, existing on the market. Available in the black or silver version and with the new 39-52option. Thanks to the new design of the parallelogram, the rear derailleur is now lighter and more rigid, with the most effective and fastest shifting. The design is derived directly from the 11-speed components with the oversized outer plate to provide greater rigidity to the entire system. The surface treatment protects it from corrosion and ensures that the Veloce™ rear derailleur maintains its performance over time. The design of the Veloce™ front derailleur cage enables perfect handling of both traditional and compact cranksets. Absolute personalisation thanks to the two colour versions available (silver or black). And the weight has been reduced to below 100 grams. Preventing energy dispersion is possible. With the Veloce™ chain, power transmission is assured. The HD-Link™ system protects you from any risk of the chain not keeping traction at the delicate closure point. 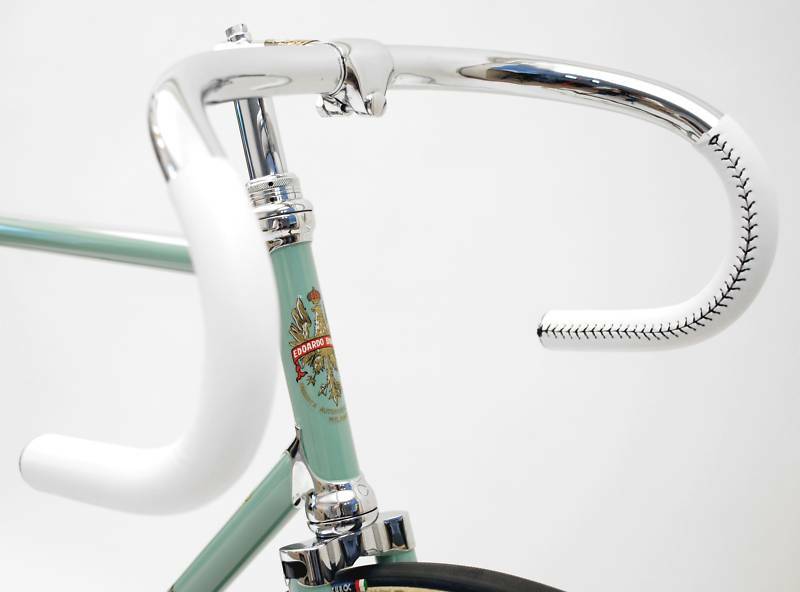 Silence and fluidity of pedalling are achieved by the perfect machining of the link profile. You don't have to be a bicycle expert: with the brakes of the Veloce™ groupset you'll have the necessary security at all times. The possibility of orbital brake-pad adjustment makes it possible to obtain the optimal braking torque with any wheel. The forged caliper with double fulcrum design ensures excellent power transmission. This time, the axle is in a single piece firmly fixed to the right pedal crank of the crankset. The perfect coupling between central pin and pedal crank is ensured thanks to the particular geometry of the two components; this solution also makes it possible to eliminate the potential play between the different materials. To make the bottom bracket more efficient, we also worked on the inner part. Thanks to an elaborate sequence of thicknesses, we were able to obtain an incredibly light axle while offering an absolute response in terms of rigidity. Thanks to the studies conducted by the Campy Tech Lab engineers, material was removed in the zones that could be lightened but at the same time the points of maximum stress were strengthened. Only in this way was it possible to achieve such a high technical value. A careful working out of the dimensions made it possible to maintain the lateral measurements already defined with the "elder brother" Ultra Torque™, thus guaranteeing the maximum freedom of movement and reducing the possibility of contact with the shoes. 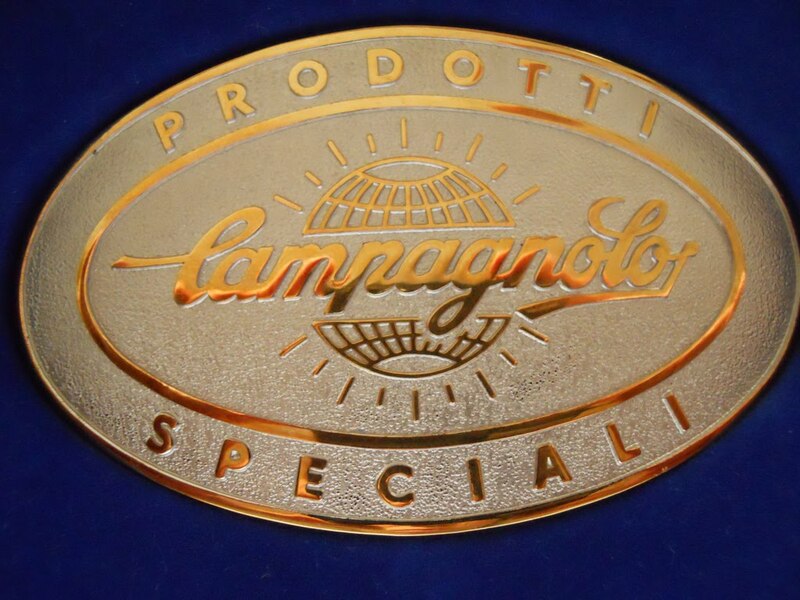 The Campagnolo engineers concentrated on ensuring that installation and servicing would be extremely simple. The most complicated work has been done, so now it's up to you to carry out four simple steps to fit the Power Torque System™ crankset quickly and with no potential for error. 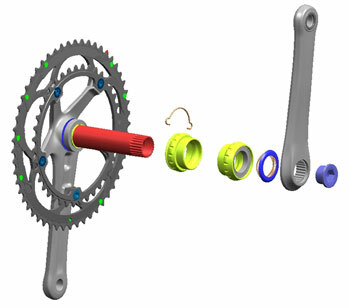 The right-hand bearing is already locked in the axle in correspondence with the crankset; the other is pre-inserted in the left-hand cup. No special tool is required, and the new crankset is ready to propel you over endless miles. That's right, because another one of the objectives of the Power Torque System™ project was prolonged operating resistance. The tests conducted by the Campy Tech Lab were very exacting in this regard." The official presentation for the 21st edition of Giro D’Italia Internazionale Femminile (Giro Donne) was held in Milano on June 9th. The most important stage race on the women's international calender it will be held from 2 to 11 July. The 10 stage race will begin on July 2nd in Muggia (TS) and after 921.90 km will finish in front of the Villa Reale in Monza (MB) on July 11th. 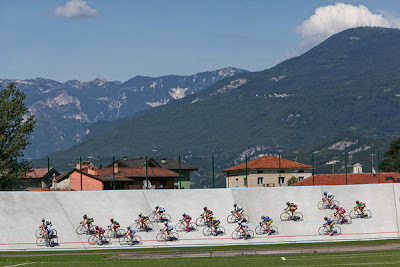 The race will begin in the Fruili region and will pass the Veneto, and Piemonte before reaching Lombardia. 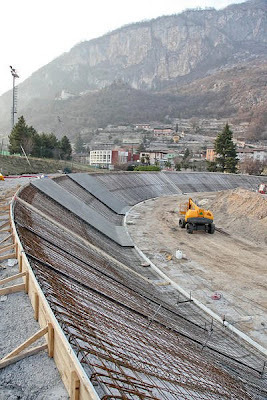 Stage 7 will feature the Ghisallo climb and Stage 9 will be a decisive stage with a finish atop the Stelvio, the stage that will be the Cima Coppi of the Giro Donne. The four jerseys to be awarded are the Maglia Rosa (sponsored by Diadora) for the winner, Maglia Verde (sponsored Poliedra) for Gran Premio della Montagna; Maglia Ciclamino (sponsored by Pasta Zara) for Classifica Punti; and the Maglia Bianca (sposnored by the Regione Lombardia) for Miglior Giovane. The race has also associated itself this year with the Susan G. Komen Italia foundation. Maria Grazia Cucinotta (top photo) and Rosanna Banfi, patrons of the foundation, have autographed the saddle of a special art frame based upon a KUOTA, created by BikeART and painted by Roberto Spadea, that will be auctioned. For stage maps see this previous blog entry. The "EICMA Bici" bike fair will coincide this year with the motorcycle fair "EICMA Moto" in Milan from 2 to 7 November, 2010. According to EICMA, the Milan show requires more to retain a leading position on the international market of bicycle shows. This consideration has prompted them to develop an undisclosed "highly innovated project" whose implementation has been scheduled for 2011. In the meantime the show retains the same formula as in the recent past. Last year the show had 45,000 visitors according to EICMA. 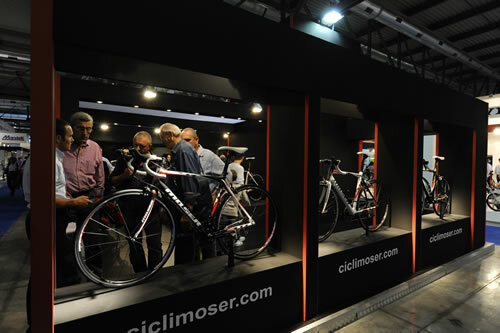 The show has seen challenging times in the last few years due to the success of Eurobike (Germany) and EXPOBICI (Padova, Italy). 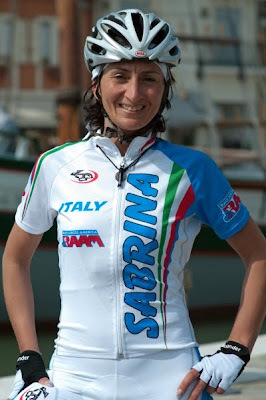 The 3,000 mile Race Across America (RAAM) starts today in Oceanside, California, and competing will be Sabrina Bianchi, the first Italian woman to take part in the race. Sabrina, from Cesena, became eligible by qualifying in the Race Around Slovenia. 2001: Milano - Roma (720 km, 29 hours). 2002: Bergamo - Roma - Bergamo (1400 km, 84h30'). 2003: Paris - Brest - Pars (1200 km, 63 hours), 14th woman place, 2nd Italian woman. 2005: Italian "Prestigio" circuit patent. 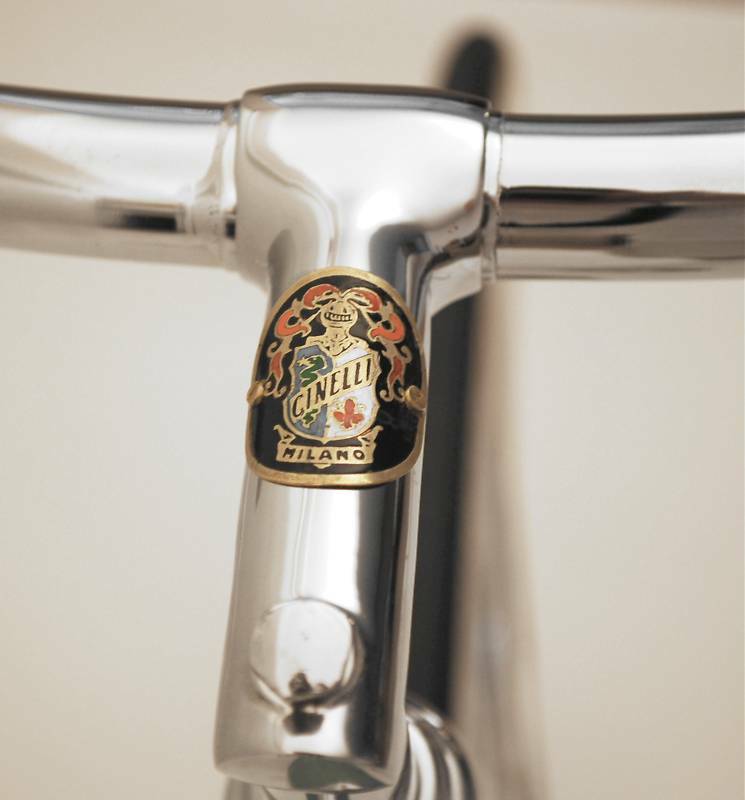 Close-ups of Bianchi's New "Oltre"
"Oltre" is Bianchi's new high end bike. 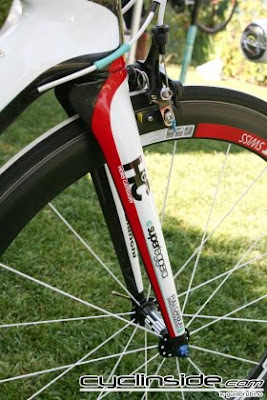 The following close-ups of two Oltre bikes were taken at the unveiling at the press only event in Bergamo on June 7th. We continue, and conclude, with the special Giro d'Italia recipes for stages 10 through 21 featured by the Gazzetta dello Sport. They are in Italian so it might take a bit of work to translate them. You can also use the translate button at the bottom of this page (scroll all the way to the bottom), you are likely to get some interesting results. Finding the ingredients may be difficult but you can try experimenting with substitutes. Sformato di Tagliolini con Pomodoro S. Marzano dell’Agro Sarnese Nocerino Dop, Caciocavallo Silano Dop e Limone Costa D’Amalfi Igp. Preparate un brodo vegetale, quando è pronto aggiungete metà della scorza di un limone. Filtrate il brodo e fuori dal fuoco unite l’amido di mais, fate riprendere il bollore per cinque minuti e tenete da parte in caldo. A parte fate una salsa al pomodoro con un fondo di olio e cipolla. Tritate il caciocavallo e conservatelo. Fate cuocere la pasta, scolatela e ripassatela nella salsa di pomodoro. Aggiungete un mestolo di brodo legato e fuori dal fuoco incorporate il caciocavallo. Versate la pasta nello stampo, lasciate riposare almeno quindici minuti e quindi fate cuocere in forno preriscaldato a 180°C per 15\20 minuti. Sfornate, lasciate riposare, sformate e servite. Panzanella di Pane d’Altamura Dop, La Bella della Daunia Dop, Olio extravergine di oliva Dauno Dop e rinfresco di vegetali. Tagliate il pane a cubi. Passatelo velocemente in acqua e aceto e scolatelo bene in uno scolapasta. A parte preparate un’ insalata di pomodori, cetrioli e cipolla e condite con il basilico, il sale e l’olio extravergine d’oliva Dauno. Unite il pane, l’insalata e le olive La Bella della Daunia, lasciate riposare in frigorifero. Servite fresca. Stufato di Vitellone Bianco dell’Appennino Centrale Igp, con zafferano dell’Aquila Dop , olio extravergine d’oliva Apruntino Pescarese Dop e patate di Avezzano. Tagliate la carne a pezzi, ponetela in una casseruola con l’olio e lasciatela rosolare. Aggiungete il porro tritato e lo zucchero e fate caramellare. Nel frattempo fate sciogliere lo zafferano nel vino bianco. Bagnate lo spezzatino con il vino e fate evaporare. Aggiungete mezzo litro di acqua o di brodo e continuate la cottura a fuoco dolce coperta. Tagliate le patate a dadi, lavatele e a tre quarti di cottura aggiungetele allo spezzatino e continuate la cottura dolcemente. Regolate di sale e lasciate riposare almeno un’ora, al momento dell’utilizzo scaldate e servite cosparso di maggiorana tritata. Cannelloni tradizionali con Vitellone Bianco dell’Appennino Centrale Igp, Mortadella di Bologna Igp, gratinati con Pomodoro S.Marzano Dop. Tagliate a brunoise il sedano, le carote, le cipolle e fatele imbiondire in una padella con 1 cucchiaio d’olio. Tagliate la carne a pezzi, ponetela in una casseruola con il rimanente olio e lasciatela rosolare. Unite la brunoise di verdure, i funghi secchi precedentemente messi a bagno e tritati. Bagnate la carne con il vino e fate evaporare. Aggiungete mezzo litro di acqua o brodo e continuate la cottura a fuoco dolce coperto. Quando la carne è cotta e asciutta, unite la mortadella fate cuocere ancora qualche minuto e passate il tutto al tritacarne. Mettete l’impasto in un contenitore e aggiungete l’ uovo, metà del Parmigiano grattugiato, la noce moscata, il sale ed il pepe. Confezionate i cannelloni con la pasta fresca sbollentata e disponeteli su di una teglia da forno. Copriteli con la salsa di Pomodoro S.Marzano, cospargete di Parmigiano Reggiano e fate gratinare in forno a 180°C per 15 minuti circa. Frittata di patate ed erba cipollina con Parmigiano Reggiano dop e Prosciutto di Modena Dop. Tagliate le cipolle tagliate sottili e fatele cuocere in padella con l’olio. Tagliate le patate a piccoli cubi, aggiungetele alle cipolle e fatele saltare per cinque minuti. Nel frattempo tagliate il prosciutto alla julienne, aggiungetelo alle cipolle e alle patate e lasciatelo cuocere leggermente. Battete le uova, salatele leggermente, unite il parmigiano grattugiato e versatele in padella. Fate cuocere la frittata prima da un lato e poi dall’altra. Servite la frittata calda e morbida. Radicchio rosso di Treviso Igp, Radicchio Variegato di Castelfranco Igp con fagioli di lago passati e olio extravergine d’oliva Veneto Valpolicella Dop con degustazioni di Montasio Dop. Lessate i fagioli a fuoco moderato, con la salvia e gli aromi sminuzzati, schiumate di tanto in tanto. Salate a fine cottura, e lasciateli freddare in acqua. Frullate i fagioli con un pò di acqua di cottura e la metà dell’olio e il pepe. A parte mondate, lavate il radicchio, tagliatelo, mettetelo in una terrina e conditelo con sale, aceto e il rimanente olio. Versate il passato di fagioli tiepido sopra il radicchio. Aromatizzate con del pepe macinato al momento a piacere. Tagliate il Montasio e servitelo come accompagnamento. Spatzle con Prosciutto di San Daniele Dop, Stelvio Dop, Mela Val di Non Dop. Preparate un brodo vegetale con l’aggiunta di una mela. Tagliate a julienne il prosciutto di San Daniele. In una padella mettete l’olio e fate scaldare a fuoco dolce il prosciutto e mantenete in caldo. Sminuzzate il formaggio Stelvio. Mettete a cuocere gli spatzle e nel frattempo sbucciate la mela e grattugiatela a filetti. Scolate gli spatzli e metteteli nella padella con il prosciutto e aggiungete la mela. Servite gli spatzli cosparsi di formaggio Stelvio. 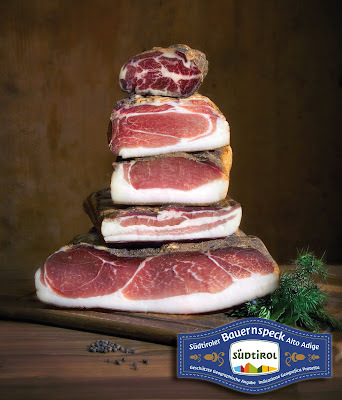 Reginelle con ricotta, Speck dell’Alto Adige Igp e Mela Alto Adige Igp. Fate rinvenire l’uvetta nell’acqua e scolatela. In una padella sciogliete il burro e fate tostare i pinoli, aggiungete il pane e fatelo tostare, unite l’uvetta e lasciate asciugare ancora. Tagliate lo speck alla julienne e fatelo scaldare a fuoco dolce in un una padella. Mettete in cottura la pasta. Con l’acqua di cottura della pasta sciogliete la ricotta e frullatela. Sbucciate le mele e tagliatele a filetti, conservatele in un contenitore con acqua e limone. Ripassate la pasta nella ricotta, mettetela in un piatto, cospargetela con lo speck, spolverate con il pane ripassato e le mele tagliate a filetti. Torta di mele Val di Non Dop e Alto Adige Igp con cannella e noci. In una ciotola lavorate le uova con lo zucchero e il burro, aggiungete il latte e aromatizzate con il limone e la cannella. A parte in una ciotola unite la farina, l’amido e il lievito. Incorporare la farina al composto di uova e in ultimo aggiungete le mele tagliate a cubetti e le noci sminuzzate. Imburrate e infarinate uno stampo a ciambella, versateci il composto e fate cuocere in forno a 150°C per 40’. Insalata di riso con Quartirolo Lombardo Dop e vegetali freschi di stagione. In una padella mettete la metà dell’olio con la cipolla tritata e cuocete a fuoco dolce. Unite i vegetali tagliati a cubetti e fateli saltare lasciandoli croccanti. Nella casseruola mettete il rimanente olio, aggiungete il riso, versate il brodo bollente e fate cuocere coperto a fuoco dolce senza mai girarlo finché è cotto. Nel frattempo tagliate il Quartirolo Lombardo a dadini. Togliete il riso dalla casseruola e lasciatelo freddare rapidamente. Prima di servirlo unitelo con le verdure saltate, il Quartirolo e il prezzemolo tritato. Mezze maniche con fonduta di Taleggio Dop, pere saltate con miele e Grana Padano Dop a scaglie. Tagliate il taleggio a cubi privandolo della scorza. Mettetelo a bagno in una ciotola con il latte per due ore. Trascorso questo tempo versate il formaggio e il latte in una pentola o bastardella d’acciaio. Stemperate l’amido in un po’ di acqua fredda ed unitelo al latte mescolando con una frusta. Fate cuocere a bagnomaria almeno per trenta minuti. A parte tagliate le pere a cubetti e saltatele con il miele. Fate cuocere la pasta, scolatela e condite con la salsa al formaggio, le pere e in ultimo il Grana Padano in scaglie. Polenta con Asiago Dop e Radicchio Rosso di Treviso Igp scottato all’Olio extravergine di oliva del Grada Dop. Tagliate a piccoli cubi il formaggio Asiago. Preparate la polenta normalmente. A parte mondate il radicchio, lavatelo e tagliatelo a pezzi di due cm circa. In una padella mettete l’olio extravergine di oliva, la cipolla tritata e fate cuocere lentamente fin quando non risulta bionda, aggiungete il radicchio e saltatelo per due minuti, quindi salate. Appena la polenta sarà pronta, spostatela dal fuoco e aggiungeteci l’Asiago. Lavoratela fin quando non risulterà filante. Servite sui piatti la polenta cosparsa di radicchio scottato all’olio extravergine di oliva del Garda. On the rain soaked, 262 km, 11th stage of the Giro d’Italia from Lucera to l’Aquila, the entire Liquigas team wore special helmets. The helmets, MET Sine Thesis models with special graphics, are being auctioned now on (Italian) Ebay as a fundraiser for the “Collectivo 99”. 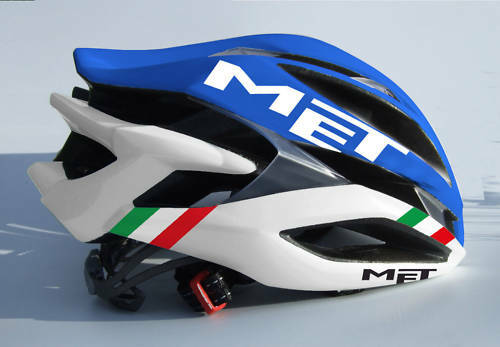 Each helmet is autographed, and included are the helmets of Basso and Nibali. The Collettivo 99 is a project to help young locals participate in an active role in the process of rebuilding a new l’Aquila which was devastated in the 2009 Earthquake. As I write this there are slightly less than four days remaining in the auction. The item number for Basso's helmet is 140412494013; click on "Vedi gli altri oggettidi questo venditore" to see the other helmets. Photos: Nibali crossing the finish line on Stage 11 (photo by Bettini); the MET Sine Thesis with special graphics. 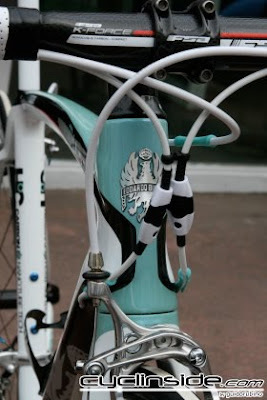 "Prestige Italian brand Bianchi have just announced two new road bikes in their line-up for 2011 – the superlight and super high end Oltre and the mid to high end carbon Sempre. And we're the only Brits to have ridden them. The Oltre is a new entry at number one in the Bianchi range, coming in as their top model HoC (Hors Category) high-performance bike, and featuring a number of aerodynamic features. The designers reckon they’ve developed a strong, stiff and lightweight frame that builds into the best performance road bike Bianchi have ever produced. The Oltre – the name means ‘beyond limit’ – is a monocoque design made from ultra-high density carbon composite (unidirectional UMS40, for all the materials boffins) so it should be hugely stiff. Epoxy resin and nano-powder (yes, nano-powder) are added to the mix to reduce the possibility of micro fractures developing. Bianchi call this their Carbon Nano Tube (CNT) technology and they say that it increases the fracture toughness by 49% over standard resin, and 20% higher than their existing nanotechnology. 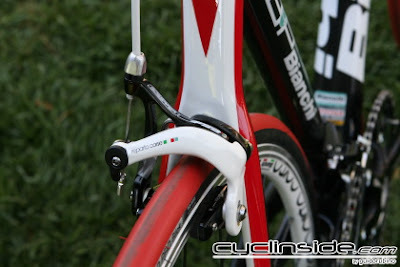 The Oltre also features Bianchi’s new X-TeX design inside the head tube area. Essentially, this is an internal moulding process that shapes the inner walls of the carbon into a grid-like structure with criss-crossing raised ridges. You know, like a waffle… but made of carbon. 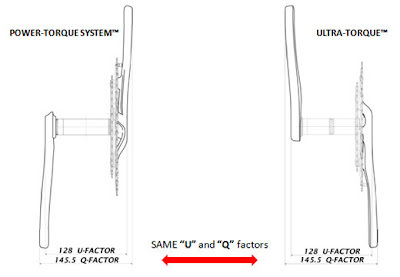 The aim is to increase stiffness and impact resistance without increasing the weight of the frame. The designers have also come up with a wrinkle-free moulding process (WMP) to reduce weight. You know that before carbon is moulded, it comes in rolls a lot like rolls of cotton fabric? Well, when it’s put into moulds, it’ll often wrinkle in certain areas, and the quickest and easiest way to compensate for that is to increase the thickness of the laminate. 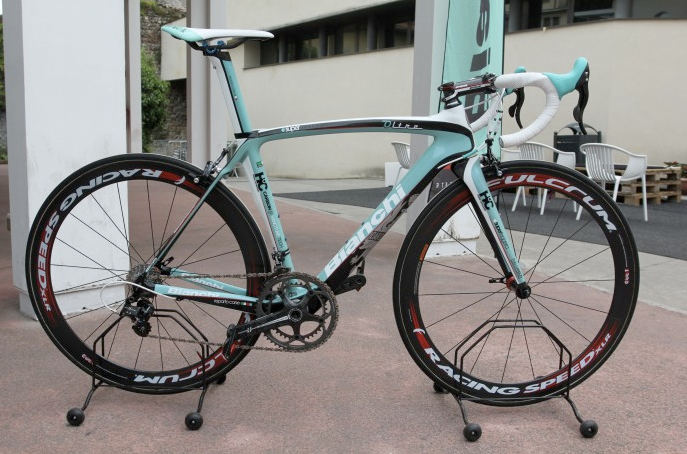 Bianchi are cagey about exactly how they do it, but by tuning the phases and the parameters of the manufacturing process they’ve avoided the wrinkles without increasing the thickness of the laminate, and so kept the weight down. The Oltre is a hell of a good looking bike with a slightly bowed top tube that tapers en route to the seat tube, a chunky diamond-section down tube and a huge hunk of a bottom bracket junction. The seat stays are skinny – really skinny – while the seat tube is an airfoil profile, cut-away at the front of the rear wheel. 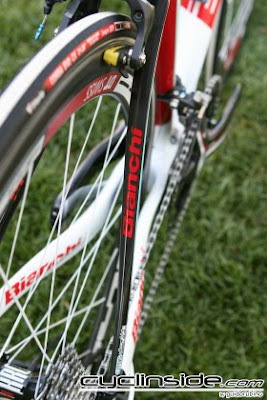 Like an increasing number of manufacturers, Bianchi have gone down the BB30 route at the bottom bracket – oversized with the bearings sitting internally rather than in external cups – to add stiffness and reduce weight, and they combine a 1 1/8in upper headset bearing with a 1 1/2in lower one for greater rigidity up front. 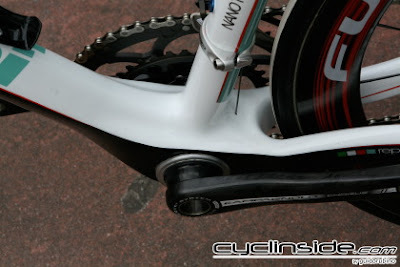 The carbon aero seatpost looks a lot like an integrated unit but it actually works like a standard model although the seat clamp is recessed into the top tube, while the cables are routed internally to improve the airflow. 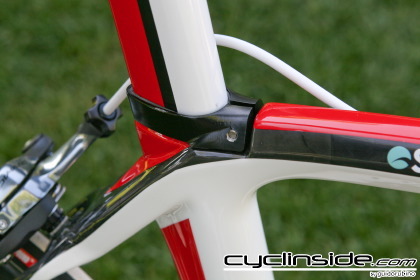 Up front, the fork – carbon, naturally – is straight legged with a winged, aero profile. It weighs 360g, which is pretty darn light for something designed to fit a 1.5in lower headset bearing, while Bianchi are claiming an impressive 950g for the frame itself (size 55cm). 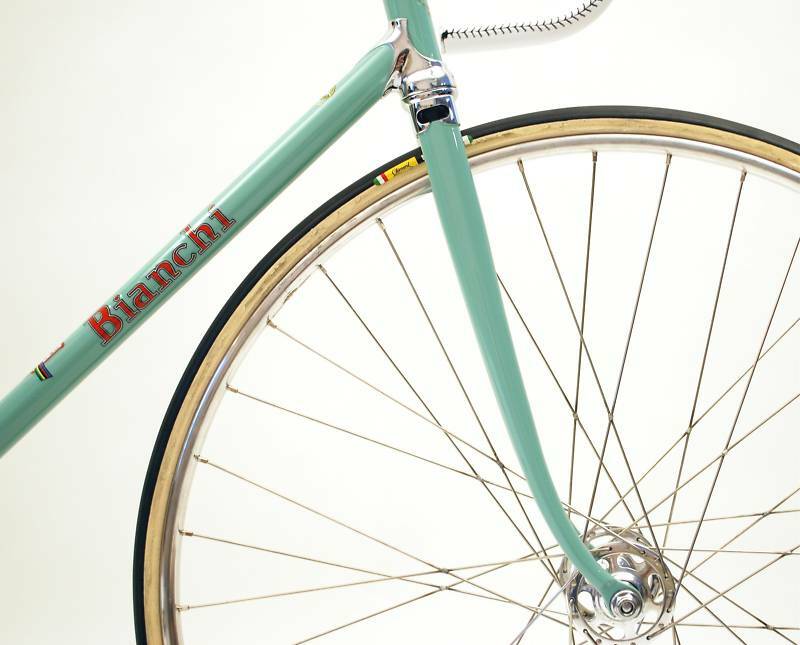 Okay, so that’s the theory; how does the Bianchi Oltre perform out on the road? We’ve been lucky enough to get some good testing in on the hills around Bergamo, northern Italy and we can tell you that this a bike that hits the designers’ targets for high-end performance. Most obviously, the Oltre is very light, and getting it up to speed isn’t so much a question of coaxing and cajoling – it’s just something that happens even when you’re not especially thinking about it. And the Bianchi’s loves to climb – it feels alive and exciting on the slopes and is always up for a quick surge of pace. (The naked carbon frame in the picture below, by the way, is a prototype model. The real colour schemes are shown in the gallery). Rigidity is a strong point here too. The meaty bottom bracket hangs tough when you get out of the saddle and start jumping on the pedals while the front end is equally solid with very little flex when you start hauling the bars about. The short head tube helps there, or maybe it’s that new X-TeX technology we mentioned. Either way, it feels perfectly sturdy. The Oltre is impressive on the downhills as well. We like the low, aggressive ride position on the descents – it feels like you’re in attack mode, taking on the terrain rather than simply reacting to it. And it’s really ping-able around the hairpins – okay, we don’t have too many of those in the UK but the same applies to any tight turns. The front end rigidity means you can point and shoot without worrying about any drift, and you have the confidence to get back on the gas that little bit quicker. We were throwing it through the tight stuff and coming out smiling every time. Do the aero features make much difference to the flat speed? In theory, quite a bit but it’s hard enough to form an impression on that when you’re riding at home never mind on unfamiliar roads. One thing we will say, though, is that we found the Oltre to be pretty comfortable. It’s not designed to be especially comfy – even Bianchi don’t make any claims in that area – the focus is clearly on performance. But we didn’t have any worries there. Fair enough, it’ll skitter a bit on poor road surfaces rather than soak it all up and we knew all about it over the short section of cobbles on our test route but, as race bikes go, no problem. We’ve got no word on prices yet but we’re working on it and will let you know as soon as we can. Oh, and Bianchi’s other new bike, the Sempre? That fits into the B4P (Born For Performance) category that’s designed to provide a racing performance at a more manageable price. And that’s all you’re getting out of us for now. A full report is coming." More photos at road.cc can be found here. The first Legnano bicycle rally was held in the Città di Legnano on May 29, 2010. Over a hundred fans invaded Legnano and participated in all the activities. Leganano bikes were ridden by Alfredo Binda, Learco Guerra, Gino Bartali, Fausto Coppi and Ercole Baldini. Also present was Filippo Gnech, one of the heirs of the Bozzi family. 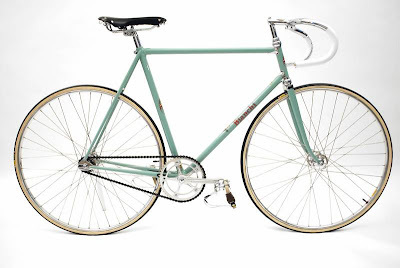 The Bozzi family once again owns the Legnano brand, after recently resolving a licensing agreement issue with Bianchi, and has plans to revitalize the historic brand . It was announced that a "Registro Storico Biciclette Legnano" (historic registry of Legnano bicycles) will be started and will include a collection of photographs, documents and information that will be of interest to collectors of the Legnano brand. Ercole Baldini, ha anche conquistato nel 1956 la medaglia d' oro ai Giochi Olimpici di Melbourne e nell' inseguimento dilettanti. 7 Giri " Tre Valli Varesine "
I previously wrote about buckle set no. 972. 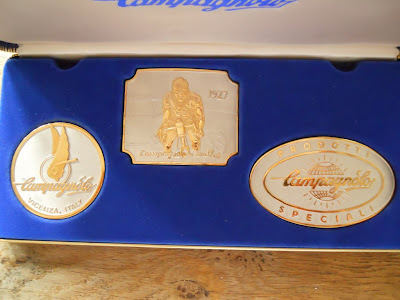 Presently on ebay is buckle set no. 348. I've taken the opportunity to grab some good close-up photos from the auction which appear above.